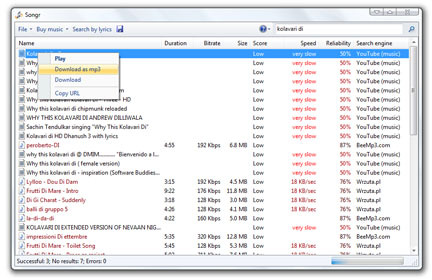 If you are searching for any mp3 song on internet, you need not to search different sites to download your favourite song. Just download this Songr software, it will help you to search and download from different music sites like Audiodump.com, BeeMP3.com, DilanDau.com, 4shared.com, GoEar.com, MP3Realm.org, Mpeg-Search.com, ProstoPleer.com, SocBay.com, Soso.com, Tagoo.ru, TinySong, Wrzuta.pl, even from YouTube. Just search your song , just right click on the song to play or download as mp3 file. It is just 4.25 MB in size. If you don't want to install it, you can download a portable version, it is of 3.8 MB in size. Just unzip it and install it. You can download it from here and portable version from here.